Ana Mardoll's Ramblings: Author Interview: Amanda Johnson on "Mommies' Priceless Moments"
Author Interview: Amanda Johnson on "Mommies' Priceless Moments"
Ana: Today we have Amanda Johnson introducing their book, Mommies' Priceless Moments. I haven't read this book myself, but Amanda was kind enough to agree to guest blog about their book to any readers who might be interested in the subject. Amanda, how would you describe your book to your prospective readers? In broad terms, what is your book about? Amanda: This book is a golden collection of short funny true stories about young children from parents worldwide. Amanda: My basic aim was to expose the real challenges that come with being a parent, and to showcase them in an amusing light. I did this by speaking with parents up and down the country, and compiling a book that contains their [zany], courageous and sometimes almost unbelievable stories. My intent is to help parents to understand that they’re not alone in their experiences. Amanda: After having my son Tyson, I decided that the best advice I got about parenting was not from the “How To” books I read, but from other parent’s experiences. The [zanier] and funnier the experience, the more I felt like I was not alone. The biggest motivation behind this book was definitely my son and the stories friends and family told me to comfort me when he was first born. Amanda: I would compare my book to "Belly Laughs: The Naked Truth about Pregnancy and Childbirth" by Jenny McCarthy. This is because her book is the naked truth about pregnancy and Mommies' Priceless Moments is the naked truth about raising children. The biggest differences between our books are that her book is only from her view and my book is a collection of short stories. Another difference is that she uses swear words in her book and mine is clean. But if you enjoyed reading Jenny McCarthy’s book you will enjoy Mommies’ Priceless Moments. Amanda: This book is my first and only published book. If it does well I hope to come up with a second book with more funny true stories about kids. 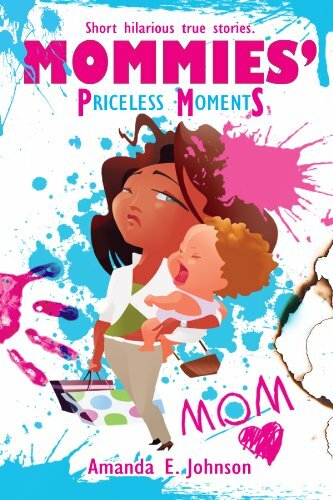 Amanda: You can buy Mommies' Priceless Moments on Amazon for $2.99. You can also buy it as a hardcopy for $9.80. You can find me on Facebook or email me. Amanda: You can preview my book here. Make sure you like my Facebook page I am always giving out prizes to my readers. I look forward to hearing from everyone so please also visit my website. There's a bit of ableist language in the interview; the responses to questions 2 and 3.